Traditionally, areas of tropical cyclone formation are divided into seven basins. These include the north Atlantic Ocean, the eastern and western parts of the northern Pacific Ocean, the southwestern Pacific, the southwestern and southeastern Indian Oceans, and the northern Indian Ocean (Arabian Sea and Bay of Bengal). The western Pacific is the most active and the north Indian the least active. An average of 86 tropical cyclones of tropical storm intensity form annually worldwide, with 47 reaching hurricane/typhoon strength, and 20 becoming intense tropical cyclones, super typhoons, or major hurricanes (at least of Category 3 intensity). Tropical cyclone basins and official warning centre. This region includes the North Atlantic Ocean, the Caribbean Sea, and the Gulf of Mexico. Tropical cyclone formation here varies widely from year to year, ranging from one to over twenty-five per year. Most Atlantic tropical storms and hurricanes form between June 1 and November 30. The United States National Hurricane Center (NHC) monitors the basin and issues reports, watches and warnings about tropical weather systems for the Atlantic Basin as one of the Regional Specialized Meteorological Centres for tropical cyclones as defined by the World Meteorological Organization. On average, 11 named storms (of tropical storm or higher strength) occur each season, with an average of 6 becoming hurricanes and 2 becoming major hurricanes. The climatological peak of activity is around September 10 each season. The United States Atlantic coast and Gulf Coast, Mexico, Central America, the Caribbean Islands, and Bermuda are frequently affected by storms in this basin. Venezuela, the 4 provinces of Atlantic Canada, and Atlantic Macaronesian islands also are occasionally affected. Many of the more intense Atlantic storms are Cape Verde-type hurricanes, which form off the west coast of Africa near the Cape Verde islands. Occasionally, a hurricane that evolves into an extratropical cyclone can reach western Europe, including Hurricane Gordon, which spread high winds across Spain and the British Isles in September 2006. Hurricane Vince, which made landfall on the southwestern coast of Spain as a tropical depression in October 2005, is the only known system to impact mainland Europe as a tropical cyclone in the NHC study period commencing in 1851 (it is believed a hurricane made landfall in Spain in 1842). Tracks of all tropical cyclones in the northern Pacific Ocean east of the International Date Line between 1980 and 2005; the vertical line through the center separates the Central Pacific basin (under the Central Pacific Hurricane Center's watch) from the Northeastern Pacific basin (under the National Hurricane Center's area of responsibility). The Northeastern Pacific is the second most active basin and has the highest number of storms per unit area. The hurricane season runs between May 15 and November 30 each year, and encompasses the vast majority of tropical cyclone activity in the region. In the 1971–2005 period, there were an average of 15–16 tropical storms, 9 hurricanes, and 4–5 major hurricanes (storms of Category 3 intensity or greater) annually in the basin. Storms that form here often affect western Mexico, and less commonly the Continental United States (in particular California), or northern Central America. No hurricane included in the modern database has made landfall in California; however, historical records from 1858 speak of a storm that brought San Diego winds over 75 mph (65 kn; 121 km/h) (marginal hurricane force), though it is not known if the storm actually made landfall. Tropical storms in 1939, 1976 and 1997 brought gale-force winds to California. The Central Pacific Hurricane Center's area of responsibility (AOR) begins at the boundary with the National Hurricane Center' AOR (at 140 °W), and ends at the International Date Line, where the Northwestern Pacific begins. The hurricane season in the North Central Pacific runs annually from June 1 to November 30; The Central Pacific Hurricane Center monitors the storms that develop or move into the defined area of responsibility. The CPHC previously tasked with monitoring tropical activity in the basin was originally known as the Joint Hurricane Warning Center; today it is called the Joint Typhoon Warning Center. Central Pacific hurricanes are rare and on average 4 to 5 storms form or move in this area annually. As there are no large contiguous landmasses in the basin, direct hits and landfalls are rare; however, they occur occasionally, as with Hurricane Iniki in 1992, which made landfall on Hawaii, and Hurricane Ioke in 2006, which made a direct hit on Johnston Atoll. Tracks of all tropical cyclones in the northwestern Pacific Ocean between 1980 and 2005. The vertical line to the right is the International Date Line. The Northwest Pacific Ocean is the most active basin on the planet, accounting for one-third of all tropical cyclone activity. Annually, an average of 25.7 tropical cyclones in the basin acquire tropical storm strength or greater; also, an average of 16 typhoons occurred each year during the 1968–1989 period. The basin occupies all the territory north of the equator and west of the International Date Line, including the South China Sea. The basin sees activity year-round; however, tropical activity is at its minimum in February and March. 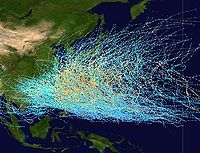 Tropical storms in this region often affect China, Hong Kong, Macau, Japan, Korea, Philippines, Taiwan and Vietnam, plus numerous Oceanian islands such as Guam, the Northern Marianas and Palau. Sometimes, tropical storms in this region affect Laos, Thailand, Cambodia and even Singapore, Malaysia and Indonesia. The coast of China sees the most landfalling tropical cyclones worldwide. The Philippines receives an average of 6–7 tropical cyclone landfalls per year, with Super Typhoon Haiyan being the strongest and most powerful to date since its landfall in November 8, 2013. This basin is divided into two areas: the Bay of Bengal and the Arabian Sea, with the Bay of Bengal dominating (5 to 6 times more activity). Still, this basin is the least active worldwide, with only 4 to 6 storms per year. This basin’s season has a double peak: one in April and May, before the onset of the monsoon, and another in October and November, just after. This double peak occurs because powerful vertical wind shear in between the surface monsoonal low and upper tropospheric high during the monsoon season tears apart incipient cyclones. High shear explains why no cyclones can form in the Red Sea, which possesses the necessary depth, vorticity and surface temperatures year-round. Rarely do tropical cyclones that form elsewhere in this basin affect the Arabian Peninsula or Somalia; however, Cyclone Gonu caused heavy damage in Oman on the peninsula in 2007. Although the North Indian Ocean is a relatively inactive basin, extremely high population densities in the Ganges and Ayeyarwady Deltas mean that the deadliest tropical cyclones in the world have formed here, including the 1970 Bhola cyclone, which killed 500,000 people. Nations affected include India, Bangladesh, Sri Lanka, Thailand, Myanmar, and Pakistan. On rare occasions, tropical-like systems that can reach the intensity of hurricanes, occur over the Mediterranean Sea. Such a phenomenon is called a Medicane (Mediterranean-hurricane). Although the geographical dimensions of tropical oceans and the Mediterranean Sea are clearly different, the precursor mechanisms of these perturbations, based on the air-sea thermodynamic imbalance, are similar. Their origins are typically non-tropical, and develop over open waters under strong, initially cold-core cyclones, similar to subtropical cyclones or anomalous tropical cyclones in the Atlantic Basin, like Karl (1980), Vince (2005), Grace (2009), Chris (2012), or Ophelia (2017). Sea surface temperatures in late-August and early-September are quite high over the basin (24/28 °C or 75/82 °F), though research indicates water temperatures of 20 °C (68 °F) are normally required for development. Meteorological literature document that such systems occurred in September 1947, September 1969, January 1982, September 1983, January 1995, October 1996, September 2006, November 2011, November 2014, and November 2017. The 1995 system developed a well-defined eye, and a ship recorded 85 mph (140 km/h) winds, along with an atmospheric pressure of 975 mbar. Although it had the structure of a tropical cyclone, it occurred over 61 °F (16 °C) water temperatures, suggesting it could have been a polar low. Within the Southern Hemisphere tropical cyclones generally form on a regular basis between the African coast and the middle of the South Pacific. Tropical and Subtropical Cyclones have also been noted occurring in the Southern Atlantic Ocean at times. For various reasons including where tropical cyclones form, there are several different ways to split the area between the American and African coasts. For instance the World Meteorological Organization define three different basins for the tracking and warning of tropical cyclones. These are the South-West Indian Ocean between the African Coast and 90°E, the Australian region between 90°E and 160°E and the South Pacific between 160°E and 120°W. The United States Joint Typhoon Warning Center also monitors the whole region, but splits it at 135°E into the South Pacific and the Southern Indian Ocean. The South-West Indian Ocean is located within the Southern Hemisphere between the Africa's east coast and 90°E and is primarily monitored by the Meteo France's La Reunion RSMC, while the Mauritian, Australian Indonesian, and Malagasy weather services also monitor parts of it. Until the start of the 1985–86 tropical cyclone season the basin only extended to 80°E, with the 10 degrees between 80 and 90E considered to be a part of the Australian region. On average about 9 cyclones per year develop into tropical storms, while 5 of those go on to become tropical cyclones that are equivalent to a hurricane or a typhoon. The tropical cyclones that form in this area can affect some of the various Indian Ocean island nations and or various countries along Africa's east coast. Through the middle of 1985, this basin extended westward to 80E. Since then, its western boundary has been 90E. Tropical activity in this region affects Australia and Indonesia. According to the Australian Bureau of Meteorology, the most frequently hit portion of Australia is between Exmouth and Broome in Western Australia. The basin sees an average of about seven cyclones each year, although more can form or come in from other basins, such as the South Pacific. 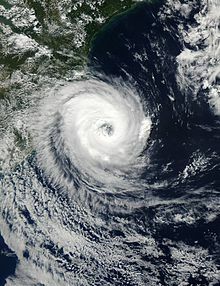 The tropical cyclone Cyclone Vance in 1999 produced the highest recorded speed winds in an Australian town or city at around 267 km/h (166 mph). The South Pacific Ocean basin runs between 160°E and 120°W, with tropical cyclones developing in it officially monitored by the Fiji Meteorological Service and New Zealand's MetService. Tropical Cyclones that develop within this basin generally affect countries to the west of the dateline, though during El Niños cyclones have been known to develop to the east of the dateline near French Polynesia. On average the basin sees nine tropical cyclones annually with about half of them becoming severe tropical cyclones. Hurricane Catarina is currently the only known tropical cyclone in the South Atlantic Ocean to have actually reached hurricane intensity. Cyclones rarely form in other tropical ocean areas, which are not formally considered tropical cyclone basins. Tropical depressions and tropical storms occur occasionally in the South Atlantic, and the only full-blown tropical cyclones on record were 2004's Hurricane Catarina, which made landfall in Brazil and 2010's Tropical Storm Anita, which formed off the coast of Rio Grande do Sul. The South Atlantic Ocean is not officially classified as a tropical cyclone basin by the World Meteorological Organization and does not have a designated regional specialized meteorological center (RSMC). However, beginning in 2011, the Brazilian Navy Hydrographic Center started to assign names to tropical and subtropical systems in this basin, when they have sustained wind speeds of at least 65 km/h (40 mph). ^ Chris Landsea. "Climate Variability table — Tropical Cyclones". Atlantic Oceanographic and Meteorological Laboratory, National Oceanic and Atmospheric Administration. Retrieved October 19, 2006. ^ RA IV Hurricane Committee (March 13, 2015). Regional Association IV (North America, Central America and the Caribbean) Hurricane Operational Plan 2014 (PDF) (Report No. TCP-30). World Meteorological Organization. pp. 30–31, 101–105. Retrieved March 28, 2015. ^ WMO/ESCP Typhoon Committee (March 13, 2015). Typhoon Committee Operational Manual Meteorological Component 2015 (PDF) (Report No. TCP-23). World Meteorological Organization. pp. 40–41. Retrieved March 28, 2015. 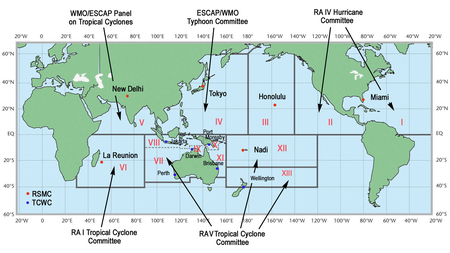 ^ RA I Tropical Cyclone Committee (November 9, 2012). Tropical Cyclone Operational Plan for the South-West Indian Ocean: 2012 (PDF) (Report No. TCP-12). World Meteorological Organization. pp. 13–14. Archived (PDF) from the original on March 29, 2015. Retrieved March 29, 2015. ^ a b RA V Tropical Cyclone Committee (November 12, 2012). Tropical Cyclone Operational Plan for the South-East Indian Ocean and the Southern Pacific Ocean 2012 (PDF) (Report No. TCP-24). World Meteorological Organization. pp. 15–20. Archived (PDF) from the original on March 29, 2015. Retrieved March 29, 2015. ^ a b c Atlantic Oceanographic and Meteorological Laboratory, Hurricane Research Division. "Frequently Asked Questions: What are the average, most, and least tropical cyclones occurring in each basin?". NOAA. Retrieved November 30, 2006. ^ Climate Prediction Center (August 8, 2006). "Background Information: The North Atlantic Hurricane Season". National Oceanic and Atmospheric Administration. Retrieved March 14, 2007. ^ National Hurricane Center (March 8, 2007). "Tropical Cyclone Climatology". National Oceanic and Atmospheric Administration. Retrieved March 14, 2007. ^ Blake, Eric S. (November 14, 2006). "Tropical Cyclone Report: Hurricane Gordon: 10–20 September 2006" (PDF). National Hurricane Center. Retrieved November 29, 2006. ^ Franklin, James L. (February 22, 2006). "Tropical Cyclone Report: Hurricane Vince: 8–11 October 2005" (PDF). National Hurricane Center. Retrieved November 29, 2006. ^ Vaquero, J.M. ; García-Herrera, R.; Wheeler, D.; Chenoweth, M.; Mock, C.J. (February 2008). "A Historical Analog of 2005 Hurricane Vince". Bulletin of the American Meteorological Society. American Meteorological Society. 89 (2): 191–201. Bibcode:2008BAMS...89..191V. doi:10.1175/BAMS-89-2-191. Retrieved January 1, 2017. ^ a b Climate Prediction Center, NOAA (May 22, 2006). "Background Information: East Pacific Hurricane Season". National Oceanic and Atmospheric Administration. Retrieved May 24, 2006. ^ a b Chenoweth, Michael and Christopher Landsea (November 2004). "The San Diego Hurricane of 2 October 1858" (PDF). American Meteorological Society. Retrieved December 1, 2006. ^ a b c Atlantic Oceanographic and Meteorological Laboratory, Hurricane Research Division. "Frequently Asked Questions: What regions around the globe have tropical cyclones and who is responsible for forecasting there?". NOAA. Retrieved July 25, 2006. ^ a b Central Pacific Hurricane Center. "CPHC Climatology". National Oceanic and Atmospheric Administration. Retrieved March 2, 2007. ^ Central Pacific Hurricane Center (1992). "The 1992 Central Pacific Tropical Cyclone Season". Retrieved March 2, 2007. ^ Leone, Diana (August 23, 2006). "Hawaiian-named storm hits Johnston Isle". Star Bulletin. Retrieved March 2, 2007. ^ Atlantic Oceanographic and Meteorological Laboratory, Hurricane Research Division. "Frequently Asked Questions: When is hurricane season?". NOAA. Retrieved July 25, 2006. ^ Weyman, James C. and Linda J. Anderson-Berry (December 2002). "Societal Impact of Tropical Cyclones". Fifth International Workshop on Tropical Cyclones. Atlantic Oceanographic and Meteorological Laboratory. Retrieved April 26, 2006. ^ Shoemaker, Daniel N. (1991). "Characteristics of Tropical Cyclones Affecting the Philippine Islands" (PDF). Joint Typhoon Warning Center. Retrieved November 29, 2006. ^ Why Typhoon Haiyan Caused So Much Damage (Report). NPR. November 11, 2013. Retrieved November 25, 2017. ^ Joint Typhoon Warning Center (2004). "1.2: North Indian Tropical Cyclones". 2003 Annual Tropical Cyclone Report. Archived from the original on June 7, 2011. Retrieved November 29, 2006. ^ "Medicanes: cataloguing criteria and exploration of meteorological environments ". www.tethys.cat. ^ "ADGEO - redirect" (PDF). www.copernicus.org. ^ Erik A. Rasmussen and John Turner (2003). Polar lows: mesoscale weather systems in the polar regions. Cambridge University Press. pp. 214–219. ISBN 978-0-521-62430-5. Retrieved January 27, 2011. ^ Schwartz (November 7, 2011). "TXMM21 KNES 071819". Satellite Services Division. National Oceanic and Atmospheric Administration. Archived from the original on November 7, 2011. Retrieved November 7, 2011. ^ "DR. JACK BEVEN'S Images of the Mediterranean 'Hurricane' (1995) Archived June 5, 2011, at the Wayback Machine". www.mindspring.com. DOC). Archived from the original on September 8, 2006. Retrieved November 29, 2006. ^ a b G. Kingston (August 1986). "The Australian Tropical Cyclone Season" (PDF). Australian Meteorology Magazine. 34: 103. Retrieved April 29, 2013. ^ "TCFAQ E10) What are the average, most, and least tropical cyclones". www.aoml.noaa.gov. ^ "Tropical Cyclones in Western Australia – Climatology". Bureau of Meteorology. Retrieved August 8, 2006. ^ "BoM — Severe Weather Event". Bureau of Meteorology. Retrieved October 19, 2008. ^ "Tropical Cyclone Trends". Bureau of Meteorology. Archived from the original on September 22, 2012. Retrieved October 19, 2008. ^ "BoM — Cyclone Vance produces highest recorded wind speed in Australia". Bureau of Meteorology. Retrieved October 19, 2008. ^ RA V Tropical Cyclone Committee. Tropical Cyclone Operational Plan for the South-East Indian Ocean and the Southern Pacific Ocean 2014 (PDF) (Report). World Meteorological Organization.